A few years ago, the American Film Institute released their list of the AFI Top Epic Movies. To qualify as an epic, a film had to be a large-scale production that offered a cinematic interpretation of the past. Legendary screen actor Kirk Douglas announced the winners, and I’ve typed them up so that you can enjoy them, too. Just remember that these films feature a longer length than most, so be sure you allow enough time in the evening to finish them. 10. The Ten Commandments (1956) – Charlton Heston headlines an all-star old school cast as Moses, an adopted Egyptian prince who teams up with the Christian God and frees the Israelites. Yul Brynner is Pharaoh Ramses II, his adopted brother and the film’s central antagonist, and don’t miss appearances from Vincent Price, Herb Alpert, Robert Vaughn, and John Carradine. The acting is wonderfully over the top, the special effects are cutting edge for their time, and the film would’ve raked in $977 million at the U.S. box office if released today (adjusted for inflation). 9. Reds (1981) – Warren Beatty starred, directed, produced and co-wrote this tale of John Reed, an American journalist and communist who penned Ten Days that Shook the World, an account of the Russian Revolution intended to bring the spirit of the movement to the U.S. Beatty picked up a Best Director Oscar for his efforts, and the excellent supporting cast includes Jack Nicholson, Gene Hackman, Diane Keaton, Paul Sorvino and Maureen Stapleton. 8. 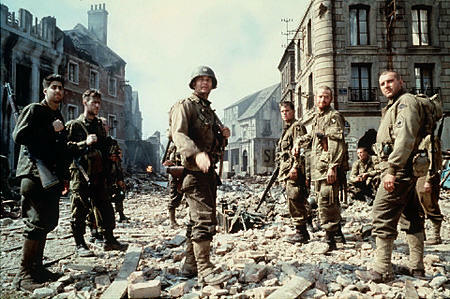 Saving Private Ryan (1998) – Steven Spielberg directed this film which radically changed the way modern war movies were shot. The opening scene, the storming of the beach at Normandy, is uncomfortable to watch due to its raw depiction of carnage and desperation. The rest of the film isn’t much easier, as it drives home the point of the sacrifices made during World War II. Starring Tom Hanks, Matt Damon, Tom Sizemore, Ed Burns, Barry Pepper, Vin Diesel and Adam Goldberg. 7. All Quiet on the Western Front (1930) – If you thought WWII was horrible, wait till you see this film about the horrors of World War I. Seen through the eyes of German soldiers, this movie begins with a group of young men eager to serve the Fatherland. But once they get to the front and witness the absolute futility of modern warfare, they begin to reexamine their earlier enthusiasm. For the sheer power of its anti-war message, it’s hard to beat this film. It’s also interesting to note that Hitler had the film banned in Germany during the ‘30s and ‘40s, and earlier showings in German cinemas were disrupted when Nazis released rats throughout the theatre. 6. Titanic (1997) – Prior to Avatar taking the top spot, director James Cameron had the ultimate box office performer with the tale of an upper-class girl (Kate Winslet) who falls in love with a poor artist (Leonardo DiCaprio). Unfortunately for the young lovers, their romance takes place during the maiden voyage of the doomed Titanic. People seemed almost hypnotized when the film was released, as housewives desperate for a little romance went to see it again and again. Nominated for 14 Oscars, Titanic won 11, including Best Director and Best Picture. 5. Spartacus (1960) – Kirk Douglas stars as Spartacus, a Thracian slave and later gladiator who leads an uprising against the Roman Empire, especially the unlikable general and politician Marcus Licinius Crassus (Laurence Olivier). Stanley Kubrick directed this action-filled epic, and any guy who’s ever watched it gets a chill up their spine during the testosterone-fueled “I am Spartacus!” scene. 4. Gone with the Wind (1939) – Considered one of the greatest films of American cinema, this classic epic won eight Oscars, sold the most tickets of any U.S. film ever made, and enjoyed a number of theatrical re-releases over the years. Set against the backdrop of the American Civil War, the movie tells of the complicated romance between the prideful Scarlett O’Hara (Vivien Leigh) and the roguish Rhett Butler (Clark Gable). The film’s score has been ranked the second best of all time by the AFI, and Butler’s famous last line, “Frankly my dear, I don’t give a damn,” has been selected as the most memorable line in movie history. And its list of achievements and influences just goes on and on. 3. Schindler’s List (1993) – Steven Spielberg makes the list again, this time with his haunting film about German businessman Oskar Schindler (Liam Neeson) and his heroic efforts to save Polish Jews by putting them to work in his factories. Filled with a mixture of brutality and touching humanity, this picture will reduce many audience members to tears before the end credits. 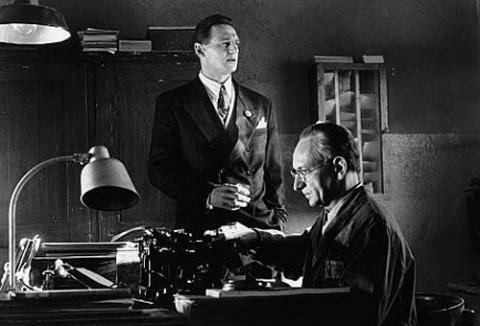 Ben Kingsley shines as Schindler’s Jewish business partner and accountant, while Ralph Fiennes portrays pure evil as Amon Goth, the real-life head of the Plaszow concentration camp. When you see Fiennes on the screen, expect someone to get shot in the head. 2. Ben-Hur (1959) – The winner of 11 Academy Awards (only matched by The Lord of the Rings: The Return of the King and Titanic), Ben-Hur stars Charlton Heston as a Jewish merchant who’s betrayed by a friend and placed in slavery. As the years go by, Ben-Hur plans his vengeance, rises to the rank of a Roman citizen, and receives an act of kindness from Jesus. The chariot race sequence is the best remembered, and it required an 18-acre set, 15,000 extras, and five weeks to film. 1. Lawrence of Arabia (1962) – Based on the life of T.E. Lawrence, this motion picture stars Peter O’Toole as a British officer sent to assess the prospects of an Arabian prince (Alec Guinness) in his rebellion against the Turks. He quickly makes a name for himself in the inhospitable desert, but events such as being forced to execute a man he had previously saved begin to wear on the idealistic Lawrence. The score, the beautifully-framed shots of the desert, a vibrant screenplay, and O’Toole’s passionate performance all combine to make this the greatest epic film ever made. Instantly watch unlimited TV episodes & movies over the Internet right on your TV, computer and various mobile devices. Watch as much as you want, as often as you want for only $7.99 a month. Start your free trial today! This entry was posted on Tuesday, May 11th, 2010 at 4:43 pm and is filed under Good Movies. You can follow any responses to this entry through the RSS 2.0 feed. You can leave a response, or trackback from your own site.